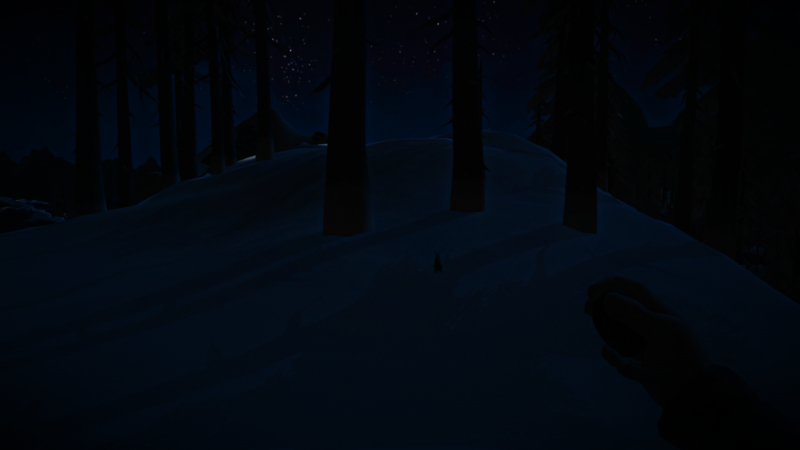 Hope you've already done some Interloper runs before, else any Sleepwalker might be quite short. Cherry on the cake would be if you could feedback your impressions, I wonder if people would feel like me about these modes. Start this day after a busy night (after all, I sleepwalk), condition 64%, the guts are cured. They are at 50% decay, I fear for the ones in the trailer. Check outside: FL-20, I decide to make a new verification of this messy farmstead (nothing found), harvest ancient torches from previous passage, craft vegetables, sleep 1h. Mid-morning: FL-8, clear and no winds, perfect for moving. 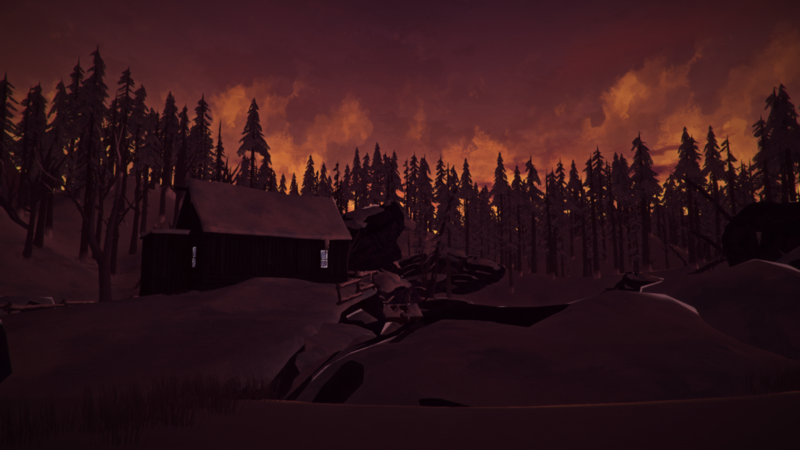 Check an empty dead body, the winds are back, but from the church so I’m shielded for now, the bottleneck tower is populated with 3 deer, so it should be OK. 5 birch in the hay field, I hesitate to use the buildings shielding to maglens a fire to warm up a tea, but I decide it’s best if I do it later, just pray for the sun to stay strong. I sprain a wrist in the ascent to the church, which doesn’t matter, I didn’t plan to kill a rabbit. I start freezing behind the church, I start a maglens fire, protected by 2 deers and a rabbit. Good excuse to warmup rose tea and snap the rabbit? I decide a 2 hr sleep is better. I healed the wrist, the outdoor fire has kept my fire, I go snap the rabbit with my full tempbar, the one I had to give to the wolf last time. Plus a second one, and get barked at. How is it possible? I'm supposed to be protected by deers all around. Do wolves don’t eat deers anymore? Oh, I got it, the the same wolf from first passage, and he thinks I'm good at killing rabbits, and he's too lazy too make it himself. But this time I won, I got the rabbit, and the fire. He finally gets a revenge on a deer he had to hunt himself. I drive a deer in front of me while going to the trailer and find enough sticks to get overweight (64). Inside the trailer, on the workbench the cured guts are in good condition, the decay is fast only fresh it seems. The cured deer hide is at 100%, does it happen only when you leave them on the floor? When I drop the sewing kit, I can’t craft the mitts with only the hook, so I first make a full tackle (makes sense). It takes 8 hours to make the mitts with a tackle versus 5h with a kit, but my only kit is at 45% and is way more precious than 3h on an inside bench. It’s night so I go sleepwalk near the bed. Since I still have some calories from the church rabbits. I drop a rabbit carcass and leave some stalks unharvested near the road, since there’s a wolf patrolling. I drop some sticks in order to take the rope down. I set foot and drop my rabbit carcass (the other one I left dead near the rope before hunting the second rabbit), I crouch to my house. Aurora sounds, I don’t like it when I’m outside. I’m finally home. In pitch dark I find the stairway, then a bed, sleep 8h after eating cattails, then pass time 3h. Wake up as a happy man, I slept with my new mitts, I’m at 74% health. I more and more think I’ll go up again once I pick up the cured stuff in the last Milton house. I appreciate every little moment when none of my needs are red, a bit like a dead man, I guess. BareSkin12, from the future: Not really dude, a deadwoman doesn't have time to appreciate anything. The other guts should be ready around Day 15 evening, my journal tells me. That’s tomorrow evening, so I can spend the day on vacation, read cooking book, eat cattails, craft vegetables, this kinda stuff. My fishing tackle is down to 21%, so I prepare a new one with the second line a gut gives you. I have 3kg of cattails, can you believe it? Pretty sure I could make some Rum from that. It’s been blizzard all day long anyway, as if the weather synchronized on my activity (God complex). I feel so healthy (81%) I even craft a bandage, cause hey who knows? Sleep 6h, then sleep walk until morning. Wake up at 86% health, today’s mission is to retrieve cured guts and begin deer boots crafting. The 2 bridge wolves are still there, which I interpret as a free city. Since the guts are not cured yet, I head to the signal tower, I hear footsteps and crouch back, hear more, I hesitate, I peak an eye above the hill, my flare in hand: that’s 2 rabbits in a marsh. Light fog, so match-torch-fire near the tower in order not to freeze, go snap the rabbits and loot cattails (I could open a shop), while making water, back to positive FL at 83% health. The tower supply bin has nothing to offer me. There’s a cave nearby : coal,empty backpack. We are just above Orca, could be a nice route to sneak out of Milton. Harvest a birch, there’s also a vine climb, to where? I don’t care, too cold to think! But I guess towards the bridge that follow the cave exit in Wintermute. The weather clears up, it’s a beautiful day, I say to myself, out loud, eating the rabbits. The wind picks up, but I’m protected under a rock. After I finish eating the rabbits, I go loot the remaining cattails, by curiosity take the vine climbs since we’re past noon and I can windshield. 3 climbs, then a cave: 2 cedars, 2 coals. I decide not going further, since it’s narrow and ends up inevitably in wolf territory somewhere. Confirmed: I can see the bridge at the end of the passage. Winds are very strong, lateral air movement. I downclimb to the city, and avoid freezing behind a rock, without a fire. But I start a maglens one, cause it’s free and will speed up my warmup. There’s another passage to the Gas Station, some rocky arch which should give good situational awareness. I check the arch, which is rightfully called The Arch, as expected it takes you to the log field in front of the station, and there are deers that can be used as decoys. Perfect. There’s still a house I didn’t check: bandage (ahah), t-shirt, leather shoes, I think I find an MRE in a dark corner, and feel immediately stupid. Last house is my target: I find the cured gut as expected. Overweighted, I make choices: I leave nothing: it’s due to fatigue and can’t be helped. Busy day for a sleepwalker. Snowy outside in the dusk, I drop lots of stuff at my house, keep 20 cattails and craft gear, and head to the rope. I soon realized it’s suicidal, I should sleep before and go there tomorrow. I have to sleep 9h to clear fatigue. Tested the SW LV1 and got my chicklets frozen in day 5 because i didn't have enough calories to break some furniture.This mode feels much more realistic than the vanilla mode but i feel that it still needs some adjustments. And to be honest 5 days is already quite nice for a first sleepwalker run! 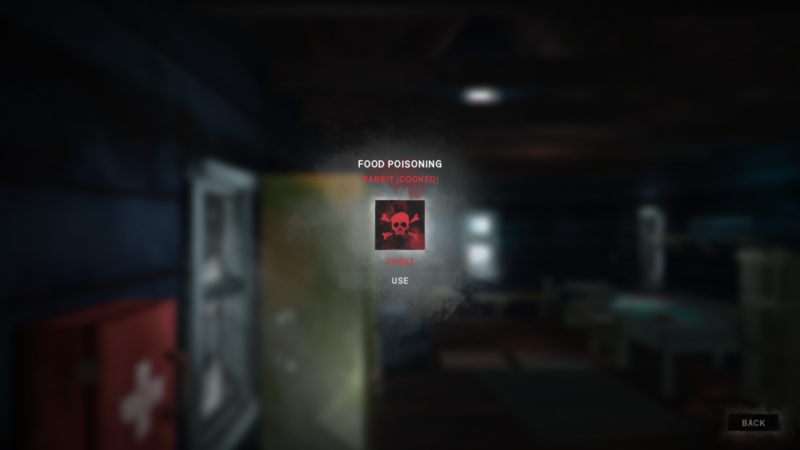 I could break them but i was low on condition and zero calories with no available food source , so it would be suicide.By the way i was searching for some mods for the game and i found this: https://www.reddit.com/r/thelongdark/comments/88jh4w/mod_release_hungerrevamped_fixing_tlds_hunger/ it is maybe the best solution for the hibernating/starving exploit because if you don't eat properly you lose body fat instead of condition, thus you won't be able to recover from it by sleeping .And if you have a high enough body fat you even get a temperature bonus so you will have a reason to always keep yourself well fed.I don't know if you have already tryied this mod out since it has been around for a long time but i will definetly give it also a try. Oh, there are folks reading your adventures! 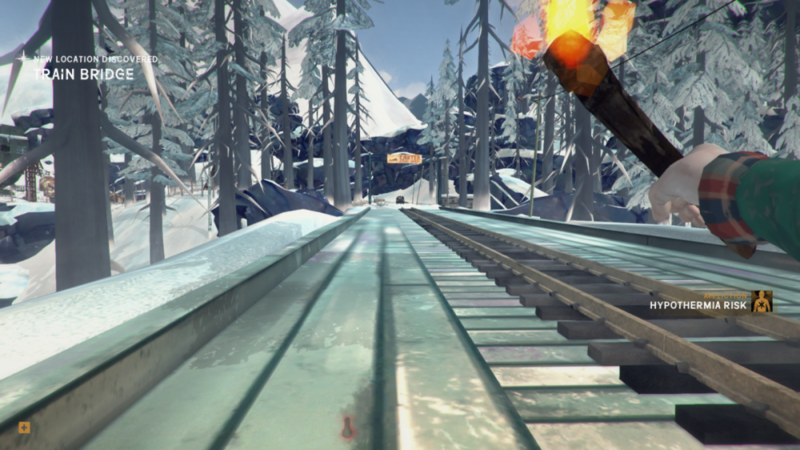 I'm super impressed by how well you took to jumping straight into interloper, and then right into extra advanced modes! But yeah, given that you wanted to learn by, well, dying, I've been just silently rooting along. I may not have so much experience on the harder modes but i have learned by watching others play TLD on interloper like LMG or Graystillplays in the old days,but in the end it is just about how well you do all the micro managing and if you make the right choices and not take unnececery risks. so it would be suicide. Launching a SleepWalker run... is often the first step to suicide! I understand you died from lack of calories, and as sad as it is, it's the intended behaviour of a sleepwalker: you have to be well fed. You can't afford to spend time starved, that's the whole purpose of this mode compared to Interloper. Condition is much more precious than in Interloper, that's why I believe it to be harder. The bonus in being well fed in a Sleepwalker mode is simple: you survive. I don't play modded games, but if that's the way you enjoy TLD more, no problem. Since you said this mod has been around for a while, I guess it appeared before Custom Settings were available in the "real" game, so maybe both ways end up trying to resolve the same initial problem? On SW mode, hibernating is not a good strategy: very soon, you'll die from starvation. Everytime you sleep, you'll health proportional to time slept. And if it's not soon, you'll be killed by Cabin Fever. Starving exploit in SW is a strategy only when you're at 100% health (that's rare), because you then wouldn't benefit the "awake recovery". But if you end up at 100% on SW1, try some harder SW or a deadman, because clearly that would make you a very skilled player. On sleepwalking the discussion is open, so don't hesitate to jump in ! Plus, I report adventures with delay, so any map-tips like "oh, there is a cave right there" is quite useless anyway. I'm not there anymore. Also, I now have a lot more experience about the mechanics, and I'm glad I discovered it myself, so there are much less comments that could potentially be spoilers. Glad to know you read me, warms up my "core body temperature"
Wake up at 84%, grab additional water and cattails, head to the rope straight away. FL-14, light fog. Grab the dead rabbit and drop it at the top of the rope, two more rabbits on the road I leave them alive because I lose 1% to freezing before making it to the trailer. I start crafting right away: 20 hours needed for a deer pants with a tackle. First run is for 6h, then I go outside to the living rabbits, snap both and drop them as soon as they're dead for not attracting the nearby wolf, go to the marsh to maglens-cook the (previously) dead ones near the rope, and grab the last cattails. 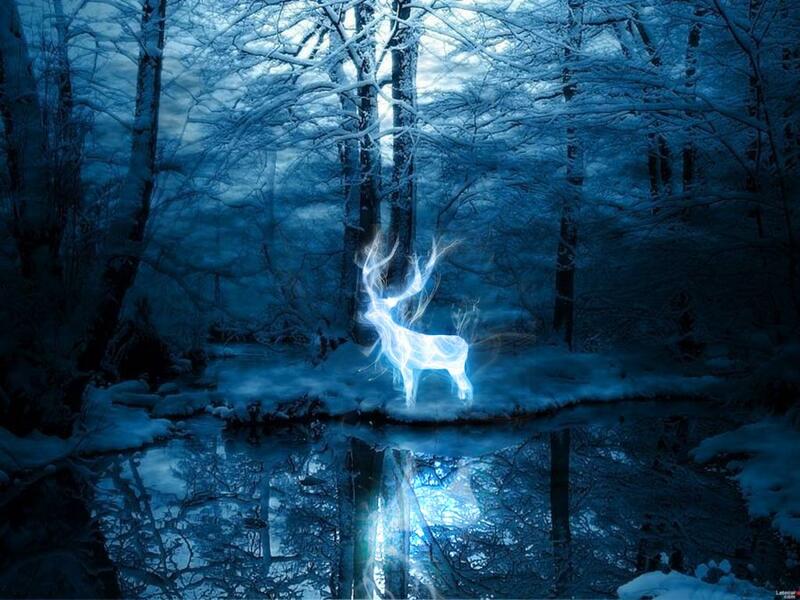 The deer is protecting the trailer (Patronus! ), so on my way back I grab the two freshly dead rabbits. I’ll harvest them when I‘m starved. The deer protecting my crafting Trailer. Now I need to sleep, crafting is exhausting. I have a cup of coffee but want to keep it in case of emergency, which is the scientific name for “rope to climb or be dead”. I crafted 6h and my tackle is already at 50%. I will have to chose between crafting a new one or making a snare with the spare gut. Wake up at 90%. Harvest the rabbits starved, eat cattails, new 6h crafting session from dawn to noon, finishing the second tackle. Forgot the third hook in my house’s fridge, so I use the sewing kit to finish the work (5.6h). It works and leaves the kit at 17%. 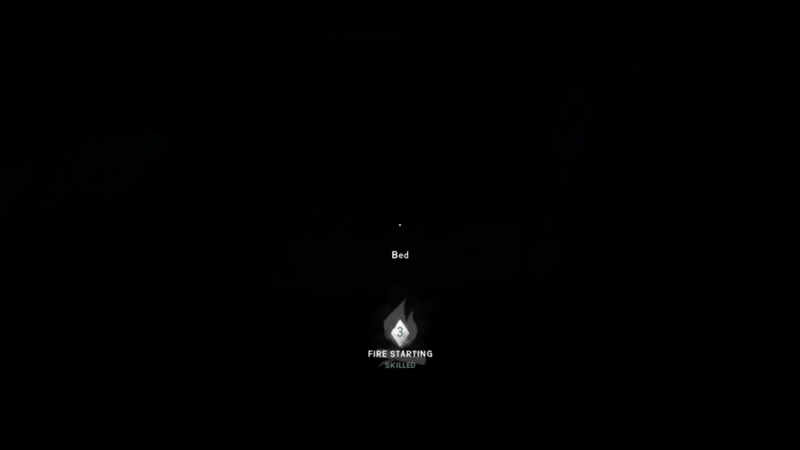 I decide to use a match to cook the rabbit before sleeping, the day has been foggy. The dog food I left last week for the wolves is still closed. Ahahaha, poor wolves, they must be hungry. I’m not. I make the snare before sleeping, since at least I didn’t forget the reclaimed wood in my fridge. Wake up at 99% health, of course crafting at the bench doesn’t implies hyporisk, which is my main source of condition loss. I leave the trailer with 300 calories cooked rabbit on me, but I don’t want to eat it and lose it on the rope. I, for once, run into my house to avoid hyporisk (lose1%) and the wolves. This morning was cold, lateral winds. Eat the rabbit as soon as I’m in front of my fridge and begin doing chores while renewing the water stock (transferred maglens), I stocked 100 sticks. I prepare my backpack for when I’ll go to the gas station: I leave behind tons of loot (sticks, cloths..), prioritize the saplings, cattails and coal, I take the storm lantern instead of torches. I don’t leave any calories. I sleep 1h chunks waiting for the blizzard to end, which happens just before nightfall. I am now entitled to one (ONE) heavy-snow-low-wind-fog. Transfer to Orca via the Arch, the winds in my back. Wow, you need a prybar to open the Station? Didn't know that. I had one, but I hope there’s one nearby if you don’t. I spend a match-torch-barrel in the station to loot it, I want to be ready first hour tomorrow morning to exit he place: peaches, beef jerky, tinderbooks, soda machines with no soda inside, chocolate bar*2, dog Food*2 ~40%, new Catherine, salty crackers. I eat everything except the crackers, since I’m already at 30kg backpack, and go sleepwalk. I dream about being there, but I don't even have a car. Or do I? 3/ So you end up being fat and transport calories for free, but without more body weight? Had I coded this thing, I would have made that the more you have fat, the less you can carry. 4/ It doesn't change the "sleeping recovery" curve, so healing is still very easy, and it seems immersion breaking for me to be nearly dead one evening, then 2 nights later around 80% health. Even at -5%/h, it means you can starve yourself 7h (half a day), then sleep-heal 35% back for negating the effect. In Sleepwalker level1, you starve yourself for 7h, you have to stay fed and awake for 7h to compensate. At level 3 and more, each hour passed starved asks for 4h fed as compensation. All in all this mode sounds actually easier than Interloper because of its easy start, even if more realistic about hunger management. The philosophy behind this mod is really well thought, if you started with 0 fat that would make a better Interloper. Well, it's realistic. Even if it may be bad for gameplay reasons. And TLD generally sacrifices realism to threaten you with immediate doom. But normally people aren't malnourished when they crash in the wilderness. And you can starve for a while before you have real problems. Water is a much bigger short term issue. I still think it's a nice idea and there can be further tweaks. The calories store could of course be adjusted by difficulty. And you can starve for a while before you have real problems. Beautiful warm morning, I drive a deer and rabbits in front of me through Milton Park. In the entry cabin, rifle book I leave, no Idea why it spawns with no rifle in game. Warming maglens fire here, then it seems I might be protected from the winds during the rope down. Sleep one hour until the fire dies out, then the rope under a good warm reishi. Once down, I drive a rabbit towards the rope up and take it. 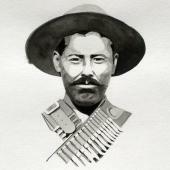 At noon, once up again, sky goes cloudy and winds becomes strong: the weather turns bad, I make to hurry to the cave. Now that I’m overweighted anyway and will see no more ropes, I pick sticks and cattails. Before entering the map-exit cave, I look at the left: there’s a road below, a metal bridge and some big abandoned truck, no idea what this is. Never seen this, could it be that there’s no landslide on the road in Survival mode, the tunnel with the prisoner bus in Wintermute? The cave gives me 9 coals before I exit at Trapper’s. Before entering the place mid-afternoon, I place my snare and take all the fuel I see and snap the two nearby rabbits, I’ll need it renewed soon enough. Too foggy for maglens, so I harvest the guts inside and start to cure them. Inside loot: sewing kit!, cooking pot (I also took one from Milton), cooking book, cloth (took only 5), porkandbeans +cash in the safe. I do hope I’ll find a repair box and don’t regret leaving the second hacksaw at Orca. 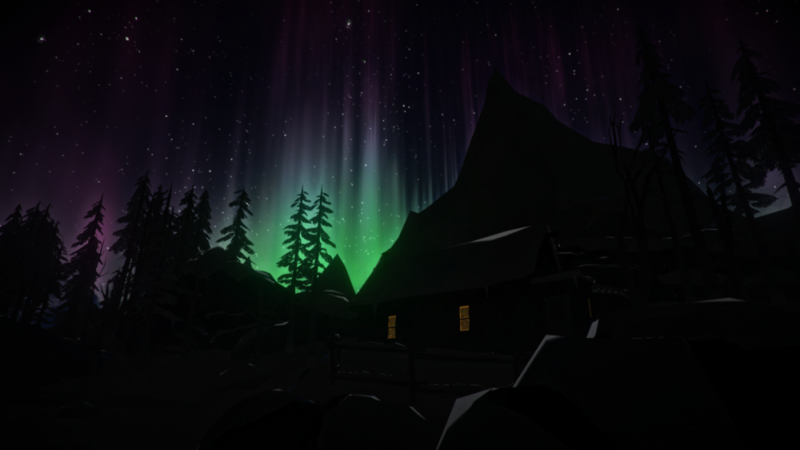 An aurora welcomes my arrival in Mystery Lake. Wake up at 82%, now I want to keep cattails for my long travels, and yesterday I couldn’t cook the rabbits without a match, which I didn’t spend. Foggy morning after 10h sleep, still no maglens, but my first snare-rabbit is here. Can’t make water, so I drink a reishi. I finish harvesting the rabbit to train carcasssing ouside, pre-fighting cabin fever which arrives only after day 20 in Custom play (10 in interloper). I miss "escaping" my hydration-only coffee, and lose my only coffee for being greedy on matches. Find a 16% granola, I throw it away, plus I’m already thirsty enough. 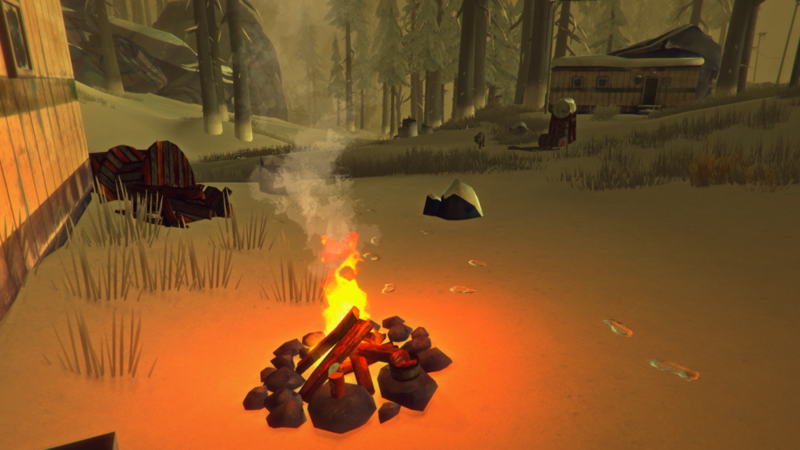 Sleep 1h and check weather until night, then I go to the deer carcass nearby to spend a match on a torch-fire. I won’t allow a full 12h night dehydrated, the health is too precious. I’m at 68% when I can drink, then cook-eat everything, plus take deer hide and guts. 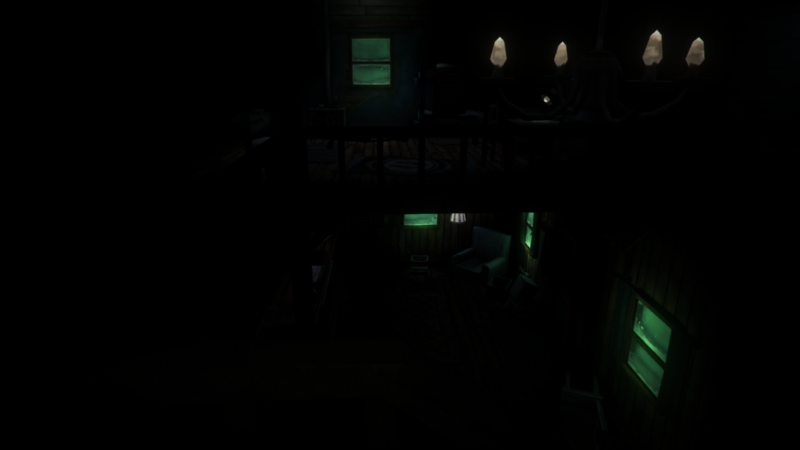 Back to Trapper’s in the midnight moonlight to sleepwalk a bit with 66 health. Since I need to be doing nothing for healing, I use the calories left from yesterday’s rabbits to read the cooking book for 4h. 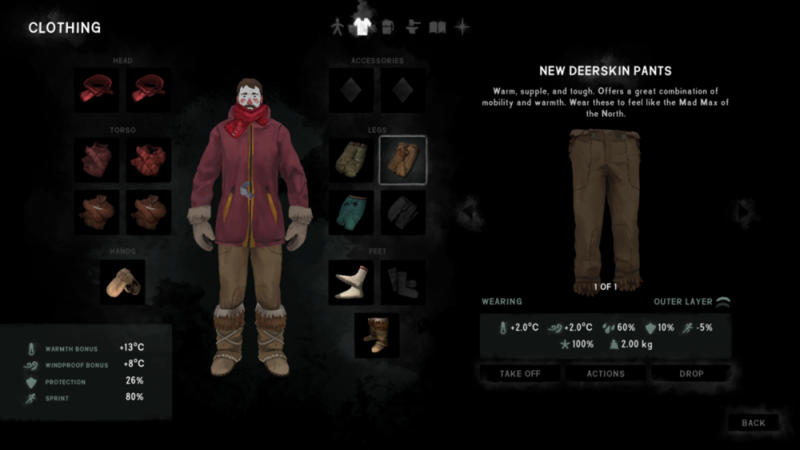 Need 1 more deer hide for my deerskin pants, and I have 5 guts to cure. 4 maples, 10 birchs. I’ll move to Camp Office today, and maybe further. I need to begin to collect metal scraps, the best is hacksawing lockers. I already have the coal (23). I go grab my morning rabbit, the Moose is here on my doorstep. I would so like to have a bow, a pistol, anything else than stones. But I never go grab the Distress in my runs, I realize. I don’t take food with me, I’ll find some at the Camp, and sticks on the way in an evening grandma’s fog. I say hello to Max, take his book on fire that didn’t prevent him from freezing. 2 maples before Deadfall, total 69 sticks when I arrive at camp after nightfall. Eat cattails and sleep. All day long, no possibility for free fire. Big aurora during, for science I check again the maglens, not working. Is that your inner Yoda speaking? The second one, I missed "night" I guess. But that's a good idea, more writing like this, I might do. My signature style, this could be. Wake up at 77%, loot Camp Office: Cooking pot *2, recycled cans, hidden maglens, sport socks, carcassing book, tinderbooks, cloth, 2 tomato soups (one at 15%), whetstone, purification tablets. I switch the socks for my precious nearly-decayed one I put in a container. Cloudy but no fog at noon, the winds push towards the Dam so the plan is: I start my round of the lake climbing the hill in front of the office, iirc some rabbits are above it, plus a cave and a possible deer carcass. Then improvise. Once outside, I say to myself, the freezing rate set to High instead of the regular interloper "very high" is really less punishing, bareskin7 would never have left the Office in such weather. At the cave: 3sticks, 1 cedar, tinderbook, rifle book (=tinder), ruined soda, baseball cap. No surprises this guy didn’t make it and is now frozen with such equipment… No firestriker this time. FL+9 in the end of cave, I harvest the rabbit I just snapped while warming up (guts ready for day27, I write in my journal). Pre-blizzard snow, I rapidly go hacksaw the deer (meat + skin). In a starting blizzard, I get caught up. Difficulty finding my way back to the cave, I have. I stack 2% hyporisk before warming up. It’s barely past noon, so I try to outsleep the blizzard, hour after hour, warming up at the same time. It’s not working, but I wont spend a match here, whatever happens this meat will be cooked by solar energy. Before pitch dark it’s still blizzard time. I have to make a call: return to the Office while there’s still some sun, or sleep outside. I choose the second option, hoping for midnight clear path. Danger is when the cave temperature will become negative, for now it’s FL+2. The blizzard stops in early night, it’s snowing silently, FL+8. At midnight, the night is perfect. I could go back to Office, but what for? I go outside to snap the second rabbit, I want to try my luck tomorrow morning, if it’s sunny I eat and continue on my lake round. I sleep for 7h starved, I finished the cattails I took already. Wake up at 62%, The sun is still missing but I can use the maglens, I do it near the deer to get the guts while cooking. 3 h fire with cedar and sticks. While the carcass is thawing I make water, cook meat, check the lake for wolves. Oh, the place is called Lake Overlook. Sounds legit. Wolves are on the lake near the Office. I will have to take these ropes down, I don’t like it. I eat a steak and finish the last hour of Wilderness Kitchen: Cooking3. There’s still 1h30 fire when I finish the meat, and bare-hands guts are 1h20. But that’s 300 calories price tag. I don’t take them, I prefer my calories so I make water instead (first time it ever happened to me to refuse harvesting because of calorie cost). The weather is snowy and there’s a high chance I don’t have another chance at maglens fire today. I’m honest with you readers, I hit “escape” and reboot from last save (morning cave awakening). I do everything the same, despite knowing that with a smarter timing timing I could take the 2 deer guts for zero calories (eating after harvesting). 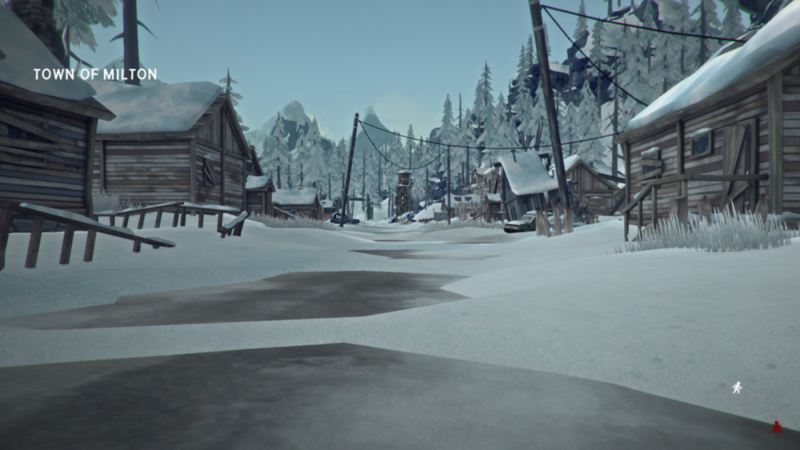 The second time the weather is not the same (it’s really randomized real-time) and I head to the rope in a clear sunny weather. I feel like I’m a cheater, but there’s nothing I can do about it now. Down the ropes, I cross the river and don’t hesitate to go for a rabbit since it’s sunny. As I approach the rabbit, I’m barked at, so I slowly walk the opposite way, and the rabbit still ends up dead, but not because of me. 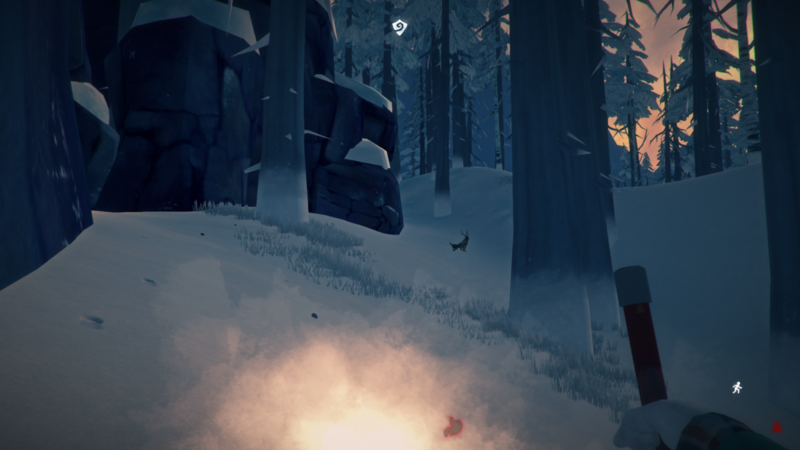 I try to cross the gill towards the cabin but it’s impossible: I end up on a rock, the wolf has spotted me while eating the rabbit and comes in my direction, I start a maglens fire, and warmup a reishi, it leaves, I make a new torch and continue. 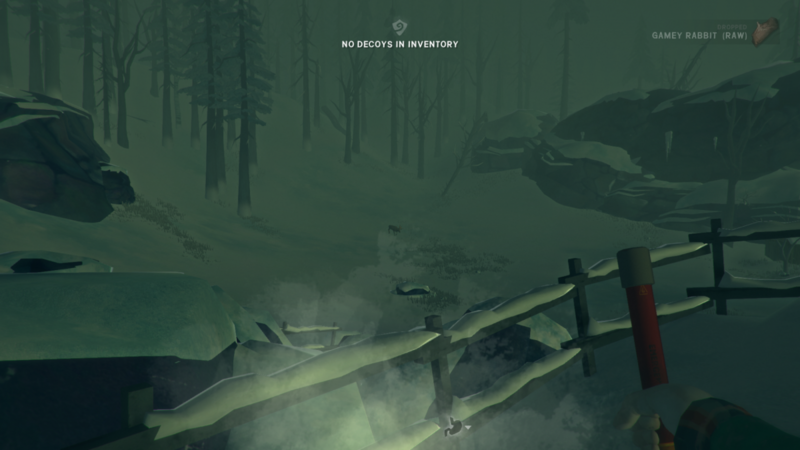 I sprain a wrist just before arriving at the cabin (55% health, lost 7% due to freezing): frozen angler at the doorstep, tinderbooks. Sleep 2h to clear wrist and hyporisk (and have a save), go loot the nearby fishut: nothing. 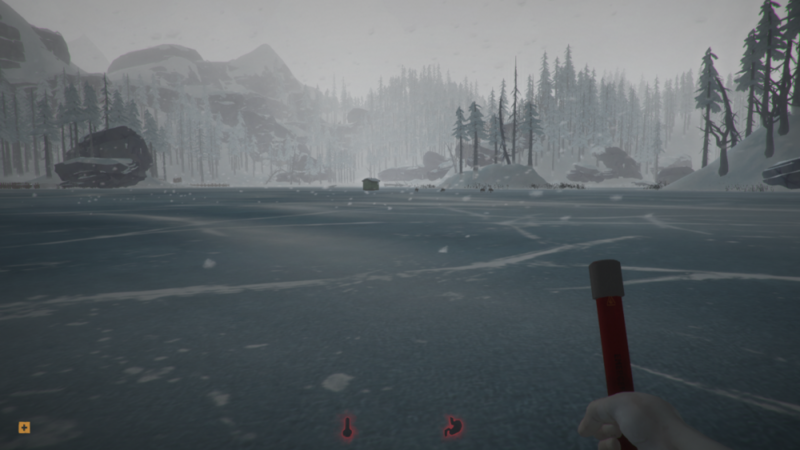 4 wolves on the left, forbidding me to continue the lake round to the next cabins. 1h later, 3 of them are in front of my cabin, the last one near my next cabin target: I could swear they read my Journal as I write it down. Maglens fire for water and for warning them: dudes, I’m not a newbie anymore. When I wake up, I cant read, so I go for one more hour in bed, and finish my calories reading a Fire book, assisted by some cattails I grab on my way, and start the day at 58% health. Outside is a snowstorm, but we can still see quite far: no wolves. Fishut: granola bar and tinder plug… as soon as I leave the hut: the threee wolves arrive slowly, to take their shift… I can’t go to the 3 cabins. They somehow see/smell me from afar: and start heading towards me: I slowly back pedal to my starting cabin, and arrive with 1% less due to freezing. Once inside, I find their behavior quite strange. They didn’t bark, they just walked to my position. I still have some cooked meat from yesterday, I could eat everything up at the overlook. That explains a lot, and also why the wolf yesterday came from nowhere and ended up eating my rabbit. Newbie’s mistake, I so rarely had a full stomach… Usually when I eat food, there’s no more food, period. 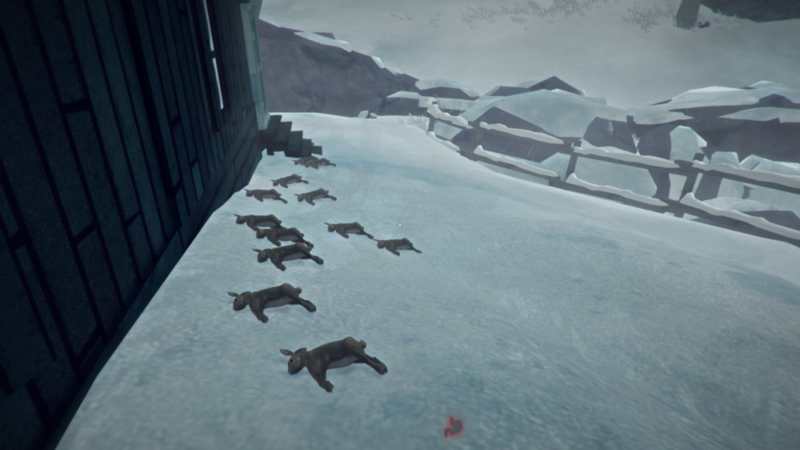 Next tempbar, once outside no wolves, I understand their spawn is somehow bugged like the Bear Bareskin7 killed. 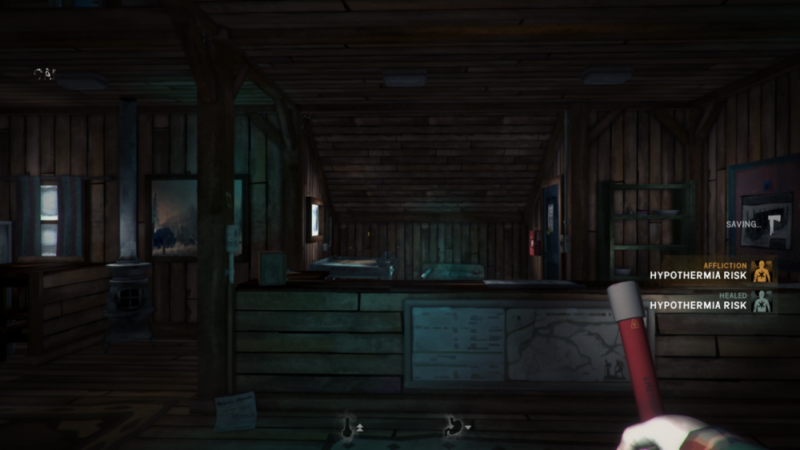 I take advantage of this bug to sneak to the next cabins before they arrive at their position and begin their patrolling. Summit Soda *2, matches (nice, had only 13 left), bandage, tinderbooks, 2 cloths. Heavy fog now: I have to stay here a while, I eat 2 cattails and sleep 2h. The gang calls themsleves "The Jacket"
Fog lifts up after 2more hours sleep, clearing fatigue. I’m overweighted after taking fir near a corpse, but can’t resist to grab stick on my way to the next cabin (the rope one), which is protected by Patronus powers. I drop 35 sticks here, and I’m sorry I didn't find the locker for scrap metal. I want to saw a locker to optimize scrap vs hacksaw ratio. It’ll be at the Dam. I find work boots but have no use for them. 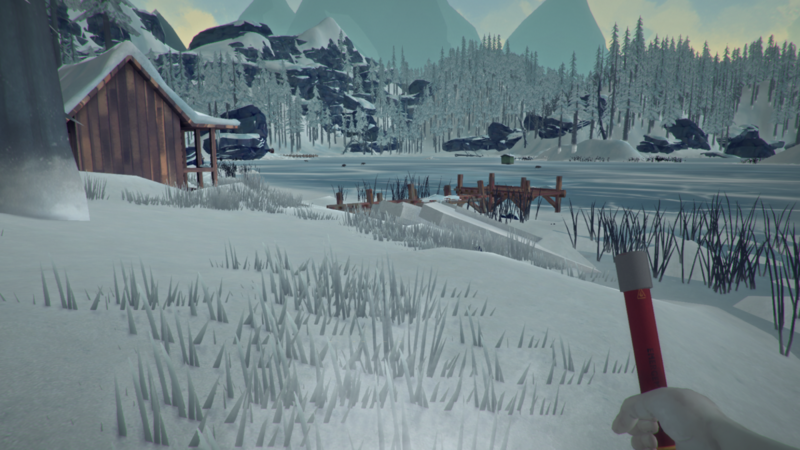 Since the wolves are all on the northern lake part, I think I’ll go back safely to Camp Office in late hours, driving a deer upon the path. In front of the fishut Bareskin7 died at, I observe one respectful minute of silence, but leave with the work gloves and the sewing kit. I arrive at camp office after dark, 57% health. Wake up at 59%, leave for the Outlook, I decided to loot the Dam before going to the forge, get some metal scraps. FL-30, I change plans and grad nearby cattails, then maglens fire for a tomato soup warmup and some water. I leave just before noon under reishi warmup instead of tomatoes, FL-19. 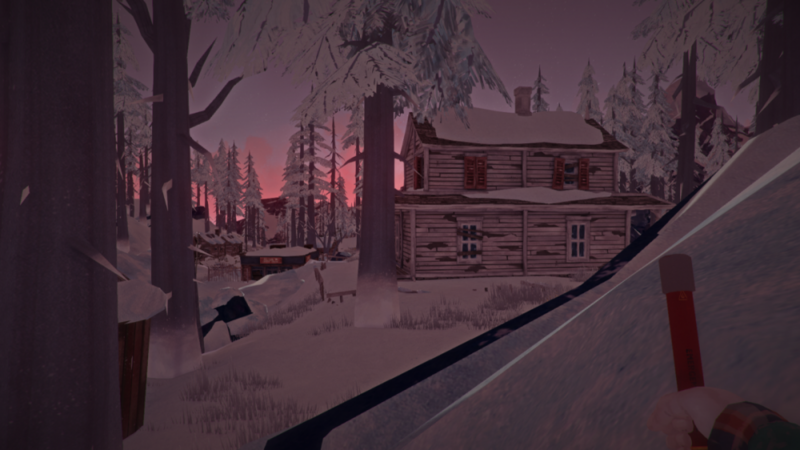 I drive a deer to the red train cars while facing the winds: absolutely no loot, and the way to the Dam is blocked, so I head up towards the Lookout after a shielded warmup fire (53%). Early afternoon, I arrive at Lookout in sunny snow, FL-4. Antiseptic (I drop), sewing kit (I take and kiss the box), Sewing Primer, cooking pot (I leave), cedar, heavy hammer, whetstone, tinder book. It’s light fog snow now, should I push to the trailers below? I decide yes, always take advantage of warm weather. There’s still no winds, so the blizzard is not for right now, and I’ll certainly have to dance at the bridge before the Dam, so an evening is better. Downclimbing, my wrist I sprain. The winds get very strong, it’s gonna be blizzard soon. I hurry up and enter the first trailer I find, alive, relieved. Looting the whole place: nothing, nothing, jeans,reclaimed. I go sleepwalk, hoping for the blizzard to end before dark in order to make it to the Dam in warm hours. The blizzard doesn’t end until it’s too dark to move. I’ll have to sleep on a cattailled stomach (51%). Oh, the place is called Lake Overlook. Sounds legit. I call it "Cave of One Thousand Sprains". Maglens in the morning for my warmup before leaving, I stop at train loading area for a deer carcass maglens which receives the Lookout cedar (1330 calories), in a hope that among the 2 wolves still patrolling the red cars, there’s the one supposed to be at the bridge. After eating, I make water and grab the skin barehands. I’m lucky at the bridge (=no wolf) and make it to the Dam, facing winds, with 48% health. Metal table is 8 scraps in 1 hacksaw use, good value. Metal shelves the same. 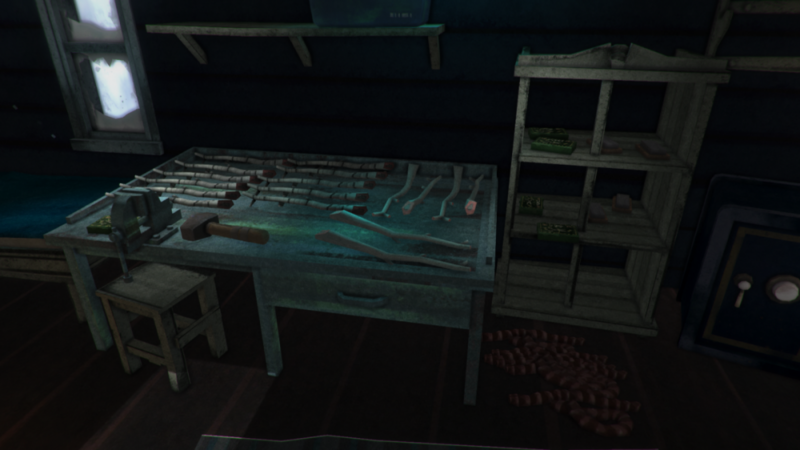 But it’s 3h work time, I’ll come back later, for now I have daylight for looting: rifle tinderbook, ragged tshirt and running shoes, cloth*2, 12 matches in the boss desk upstairs, painkillers (nice), tinderbook in a safe…, hacksaw. I finish the ground floor and first floor without a toolbox, but it doesn’t matter anymore. I’d love a tuke tho. In the lower dam: matches, matches again (man, where's my wife? ), sewing kit, the usual red wool scarf, blue toolbox, running shoes again, whetstone, jeans again, beef jerky, cooking pot. Looting the dam took me nearly an afternoon, but that was useful since I have both hat clothes now, 2 more sewing kits, one more hacksaw. Before dusk, I go outside and hacksaw the deer carcass within the fences (meat+skin). Eat beef jerky and cattails before going sleepwalk. Tomorrow, I collect scrap, and get the hell out of here. I exchange 10% hacksaw for 20 metal scraps (7h work). It snowed all day long today, no cooking. I have to leave some clothes, books, and tinder before leaving, also 7L water. The 20 metal scraps are 4kg. Trailers give 27% tomato soup and purification tablets. 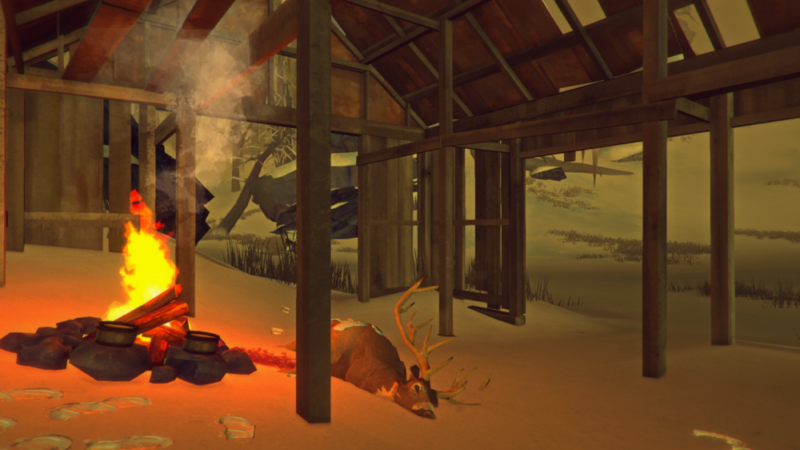 The place is not wolfed, so I also transfer the deer meat and start a torch-fire to cook it with the tomato soup. I want to go to the shrooms, but the place is wolfed after all. Pass time and sleep until noon, 49%. I’ll try to reach Camp Office and pick up the cured guts at Overlook on the way. No wolf at the blind: flare, tomato soup, a bedroll, and a weather that turns really fast into re-blizzard. 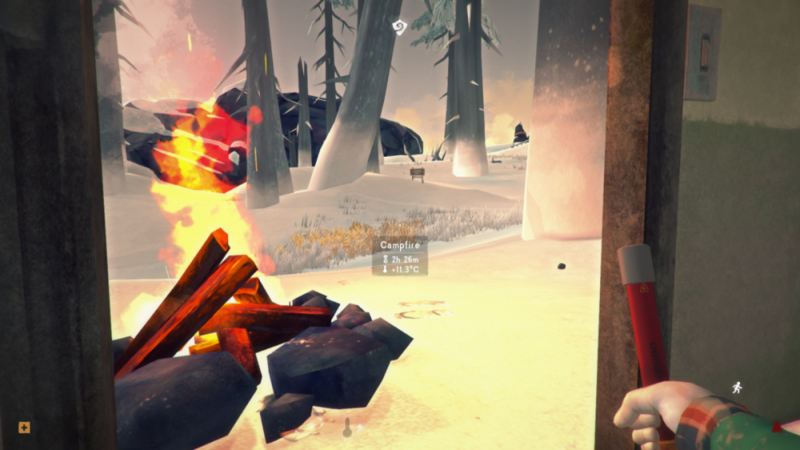 I decide to spend a match on fire near the deer carcass (1.7kg), despite the weather menace. Just before I go for the skin, blizzard kicks in and I have a hard decision to make: die at Alan's cave, or in the blizzard. 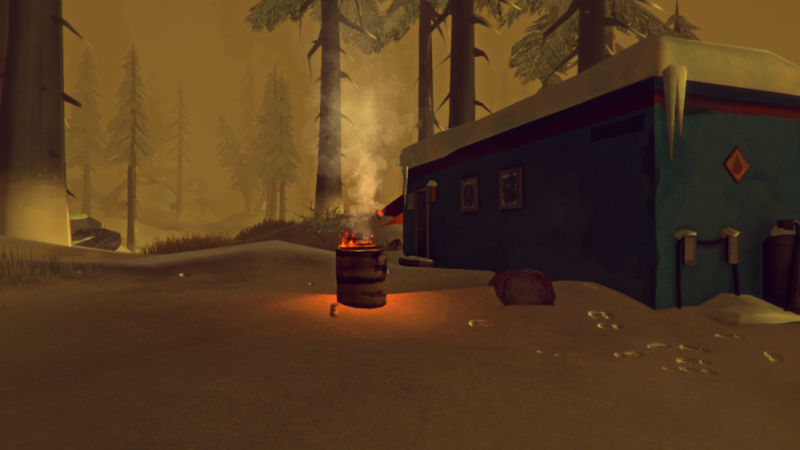 Since I don’t have the 15 sticks required for a snow shelter which would have been the perfect answer, I eat all the meat a warmup by tomato soup and decide to push on to a Lake cabin, flare in hand and wind shielded. In very low visibility I recognize the river I crossed on my first round trip around the lake, I go uphill to the Bear Cabin, which I reach with a sprained wrist (doesn’t matter) and 39% health. I was so busy I didn't make screenshots. On my full stomach, I read waiting the blizzard to end (fire starting3), but I have to sleep in here. On Interloper, read I never would, wasted time it is. 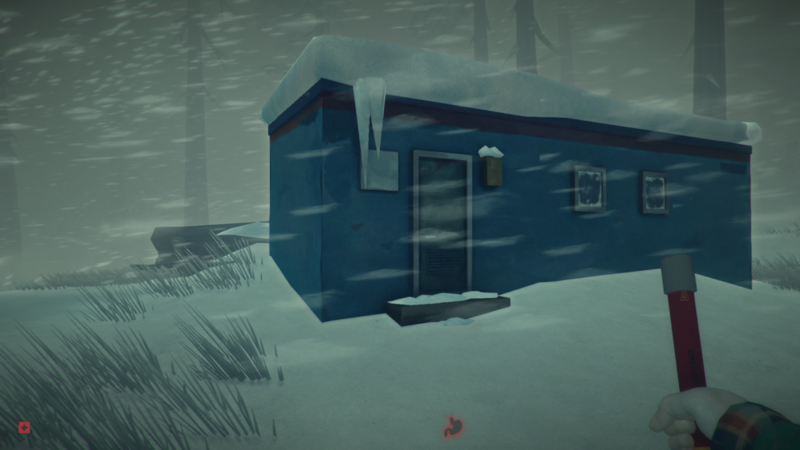 In the morning, I take advantage of the strange “wolf deployment time" to sneak out, and run to Camp Office to avoid the cold damage (FL-20, snowy). No water inside, I spent another match 4 hours later when it’s obvious there will be no sun today and I can’t afford dehydration. At nightfall, the winds still blow heavy snow but they come from north: I go grab the Overlook guts shielded by the hill, on my way up and my way back. Eat the last cattails tonight. Tomorrow, back to Trapper’s. Plan: prepare the Forge trip.And remember to speak respectfully to it, whatever happens during the trip. Wake up at 43%. Guts grabbed, I move to Trapper’s before noon, just because you never know how long a clear weather will last, FL-15. 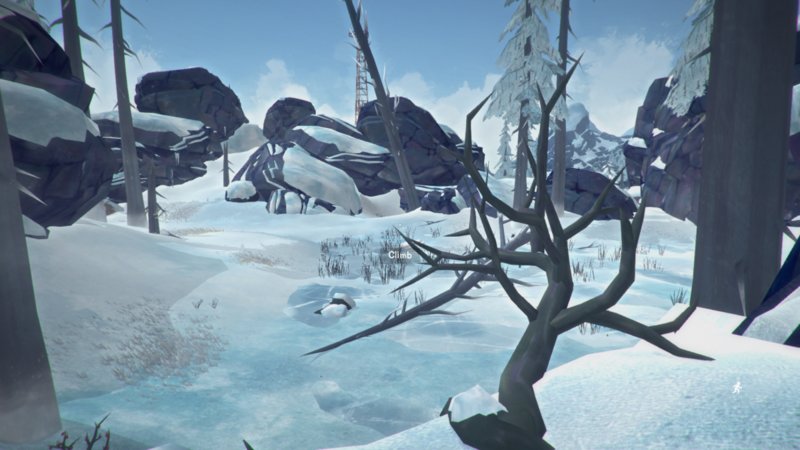 2 wolves on the way to Rail Tunnel, I’ll shortcut in the hills above Deadfall, even if I hate this place. Maglens fire at Max’s, cause I’ll be freezing soon. Back to positive FL with 3% health lost, I had to drop a reclaimed in it. The wind kill my hard-earned fire like 20minutes later, I’m barely warmed up but have to leave. I say Hi to Max, he doesn’t answer my High-five proposal, too busy sunbathing. I run all I can, I’m already in hypo, I hug the rocks and enter the cave to Milton with 35% health. We arrive in health territories I don’t like. Warm up inside (no coals), then Trapper’s in light fog. The kind of fog I will wait for when I’ll want to travel to the forge. In front of the door I find 4 68% deer steaks, I can’t remember from when but thank you, Bareskin-from-the-past. I also left 2L of water, good thing, I avoid dehydration. So ,we have a total of: 10 birch, 6 maples, 3 cured deer hides and 2 fresh, 8 cured guts, 2 reclaimed, 20 scraps. Stick run in grandma’s fog, FL-6. I craft 2 more snares, eat everything and read-heal a bit. The rest of the meat allows me to clear 8h fatigue without losing health. 37%, 1 ruined snare, 1 rabbit, 1 snare untouched. Maglens fire in early dawn, water and rabbit cooking… Heavy fog, so it’s a good time to start crafting deer pants with my 100% sewing kit, and heal a bit in the process thanks to rabbit meat and cattails stock. 4h work = -19% on the sewing kit. Then 2 more hours = -10%. Editing this after playing BareSkin15 makes me realize: sewing kit is just 2 times more efficient than a fishing tackle: 1sewing kit= 2 tackles. Warm nightfall, I go snap the 2 others rabbit (towards deadfall), and come back home, they’ll be cooked later since it’s grandma’s fog +snow tonight. 2 more rabbits in the snares. 45% health, Maglens cooking the rabbits, eat some, keep some, go finish the deer pants (6.5h left), then finish the calories finishing the reading of Sewing primer. 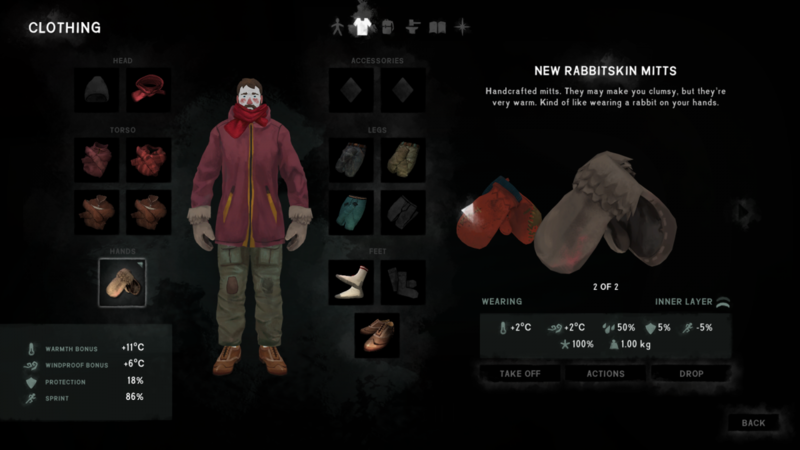 48% health, harvest another rabbit in the fog, read while waiting the sun to show up. Sun arrives around noon, maglens, cooking and water. Wind kills it once the meat cooking is finished, mid afternoon. Shielding the fire with your body does not work, unfortunately, I ‘m sure that’s a functionnality many people would love. Branch run in the warm evening snow: 16 sticks. Completely exhausted: 9h+3h to avoid dehydration. 45% health, daily chores, finish carcassing book (carcassing4), 1h inside to warm up, then outside fighting future cabin fever. Aurora night: I repair my thermal underwear (-5% sewing kit), I’m starting to make my backpack for a trip to the forge: 23coals, 3 sticks+2accelerant, 2flares, 38 cattails + crakers + jerky+ prokandbeans, 6painkillers, hammer, 20 metal scraps, 1L water. Next light fog, I’ll have to make a call. 51%, I feel better, psychology... 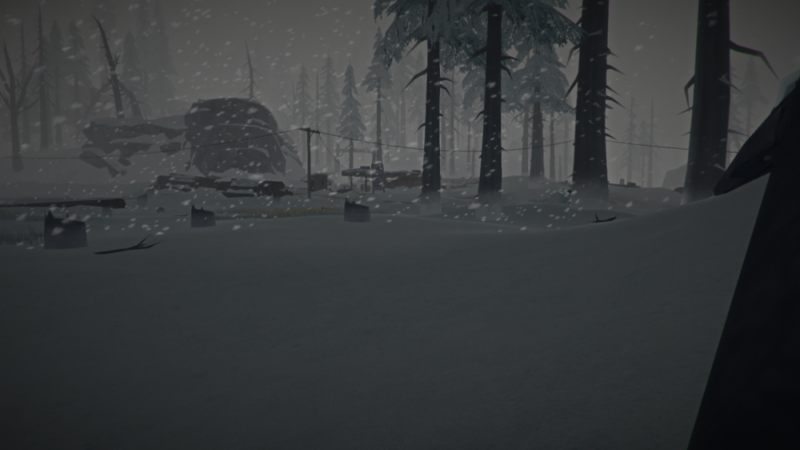 I harvest rabbits while starved, blizzard until mid-afternoon, the trip is not for today. Post-blizzard sticks run in the evening. I’m out of potable water in the morning. 52%, still can’t start a fire (strong winds), so I use an aquatab on my .5L dirty water. 2h later, 4th attempt at maglens works, the winds are still strong. And then... I get food poisoning from yesterday's cooked rabbit? 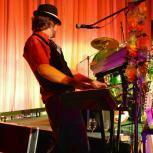 !… I don’t see anybody having the luxury of letting calories spoil on a sleepwalker run. That’s bad news, I was supposed to spend the day healing, but instead I have to ditch the calories into sleeping. I waste 4% health by deciding not to sleep before the water is boiled, then 9h sleep+1h to clear this mess. In the end I lost 5% health on the day I was supposed to gain around +10. I use crackers to avoid sleeping starved. And also to fight depression. 51%, maglens at dawn, 1h later it’s snowing silently. 2h later around 9am, blizzard… Good thing is fire is shielded. The guts I started to cure when arriving here are ready, I craft 2 more snares. At noon the blizzard is still going on, and I have nothing to read. I have no datalink on my smartphone, can’t read the forums either. Blizzard stops in late afternoon, I have to decide if I leave now. I decide yes, that’d be very bad luck if a second blizzard kicked in just after this one. 54% health, FL-6 when shielded. Before arriving at the Tunnel, I’m at half my tempbar despite having the winds in my back, so I decide it was a wrong call, let’s say I was going for a stick run. The temperatures really dropped hard. I’m back at Trapper’s with a pause in the Milton cave with 28 sticks. Had to drive a deer in a wolf, after the deer tried to drive the wolf to me… nice try, that's fair game. 58% thanks to passing time 4h during sleepwalking. Dawn maglens fire, regular chores until noon, clear sunny skies but strong winds, half hour later its foggy and snowy. If it turns to medium or light fog and the wind die, I leave for the Forge. Waiting for the new weather move, I stockpile water. My warm porkandbeans is ready, in case I leave. Nothing to say. Foggy and snowy, too cold to travel, no sticks, but I have calories and water so… why complain? Blizzard at nightfall. Wake up at 67%, foggy, the Moose is at my doortstep. Maglens fire at noon (drop a coal, no more sticks), hoping I’ll get that fog back mid-afternoon. But no. One more day, trapped at Trapper’s. Repair the 46% “outside” wool scarf.